Moonlight Dancing. From A Distance. CONDITION DETAILS Vinyl plays nicely (play-tested). Cover looks great; a few creases near edges, light-scuffing (front/back). Inner sleeve is generic white. Spine is easy-to-read, with wear. Label: Atlantic ‎– K50636. Format: Vinyl, LP, Album. We are only human and mistakes may happen. A nearly perfect record. The record should show no obvious signs of wear. A 45 RPM or EP sleeve should have no more than the most minor defects, such as almost invisible ring wear or other signs of slight handling. RECORD IS VG - SLEEVE IS GOOD . Record was tested and is in excellent condition. A4 Surabaya Johnny. Always a big variety at Lemstar Deals! B4 Twisted. B3 Uptown; Da Doo Run Run. Year : 1977 Cover Condition : Excellent - Vinyl Condition : Excellent Genre : Rock, Pop, Stage And Screen US Pressing. Coloured Inner Sleeve. Note: Any records purchased from Life of Vinyl will come with a new polythene cover sleeve and will have been cleaned using a professional vinyl record cleaner. B4 Delta Dawn. Pre-loved vinyl in VG condition. Tested on Audio Technica AT-LP5 turntable, plays perfectly. Cleaned using Spin-Clean. Sleeve in VG condition. ISSUE RESOLUTION. A1 Do You Want To Dance?. Square Deal Recordings & Supplies. Bette Midler. 1973 Atlantic Records. 33 1/3 rpm Quadraphonic LP record. Atlantic Quadradisc QD-7238. Playlist: Do You Want to Dance?. BETTE MIDLER Thighs And Whispers Label: Atlantic Catalogue Number: SD 16004 Format: Vinyl, LP, Album, Stereo Country: USA Released: 1979. And every one you buy is an original, not a copy, not a remake - all are limited editions in the hundreds at most and most, like this special show, much less. The shows that you get now and hold on to will never decrease in value and only increase. YOU CANT ALWAYS GET WHAT YOU WANT / I SHALL BE RELEASED. CHAPEL OF LOVE / BOOGIE WOOGIE BUGLE BOY. MY MOTHERS EYES. Delta Dawn..5:16. Vinyl Grade: Because the record is sealed, the grade is "Mint". Sleeve Grade: "Near Mint". The sleeve has a few bends on the front cover along the spine (see pictures). SLEEVE IS VG - RECORD IS VG . Year : 1973 Cover Condition : Very Good Vinyl Condition : Excellent - Genre : Pop US Pressing. Missing Poster. Note: Any records purchased from Life of Vinyl will come with a new polythene cover sleeve and will have been cleaned using a professional vinyl record cleaner. BETTE MIDLER Broken Blossom Label: Atlantic Catalogue Number: SD 19151 Format: Vinyl, LP, Album, Stereo Country: USA Released: 1977. 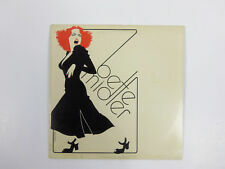 Bette Midler - Divine Madness 12" Vinyl LP in VG Condition (SD 16022). Pre-loved vinyl LP in VG condition. Deep Shine to record. Minor surface marks. Tested on Audio Technica AT-LP5 turntable, plays perfectly. BETTE MIDLER. THE DIVINE MISS M - VINYL LP. Cover & vinyl show signs of age. AS PICTURED. Yellow age spots, creases and stains. Bette Midler. Signed / autographed by Bette Midler. Format: Stereo / LP. LP Quantity: 1. Vinyl Condition: Mint-. VG- and below Let's be honest: sound quality is low and the cover may be in very poor shape. Bette Midler 1973 Atlantic Records self-titled album. Record is in Very Good to excellent condition with intact original inner sleeve. B4 Twisted. B3 Uptown; Da Doo Run Run. B2 In The Mood. ATLANTIC P10702A. ARTIST Bette Midler. TITLE Thighs And Whispers. CONDITION VINYL Excellent (EX). Japan Press. LP 3.50 Gatefold LP/2LP 7.00 7" / CD 1.50. StandardUSD 16.00 each add. LP 4.00 Gatefold LP/2LP 8.00 7" / CD 1.50. "BETTE MIDLER: Broken Blossom" LP from ATLANTIC Records. ATLANTIC LP # SD 19151. With a song featuring a duet with Tom Waits, and a cover of a Judy Henske song. Condition of the jacket; EX. Condition of the vinyl; EX or NM, light wear. Others are subtle, such as groove wear from using a cheap or poorly aligned tone arm. VG records have more obvious flaws than their counterparts in better shape. They lack most of the original gloss found on factory-fresh records. Bette Midler. Thighs And Whispers. Others are subtle, such as groove wear from using a cheap or poorly aligned tone arm. Many of the imperfections found on a VG record are more obvious on a VG record. That said, VG records are among the biggest bargains in record collecting, because most of the “big money” goes for more perfect copies. BETTE MIDLER. Category: Vocalists. Format: LP. Housed in an 8,000 square foot warehouse that currently holds over 2 million records, Craig and his talented, dedicated staff serve music lovers in more than 60 countries. He's Sure The Boy I Love (Duet With Darlene Love). Hier folgende 2 Vinyl LP / Here following 2 Vinyl LP It's The Girl. Baby It's You. Too Many Fish In The Sea. Pop international. Pop englischsprachig. 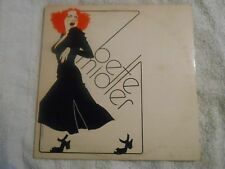 Bette MidlerNo Frills vinyl LP. Made in Canadaby Atlantic Records in 1983. Artist: Bette Midler. Title: The Divine Miss M. Year: 1972. Condition: No splits or tears on sleeve, inner liner is split. Record has light surface wear. Not tested for sound quality. Don't let this find get away. Bette Midler ‎- The Best Of Bette (LP). Format: Vinyl LP Album. When A Man Loves A Woman. In The Mood. My Knight In Black Leather. Boogie Woogie Bugle Boy. Say Goodbye To Hollywood. Fire Down Below. Bette Midler No Frills LP album with Soda And A Souvenier Bette vinyl! Vinyl & Sleeve Gradings This is a visual grading system. Never been played. Near Mint (NM) A nearly perfect record. The record should show no obvious signs of wear. Sleeve will have no more than the most minor defects, such as invisible ring wear or other signs of slight handling. • Bette Midler - The Divine Miss M • vinyl record, vintage 1972 there is some wear on the cover and a spot on the record itself, however i played it through and both sides play perfectly fine! BETTE MIDLER IN DIVINE MADNESS. Vocals - Bette Midler. Guitar [Lead] - Chas Sandford. Straight out of my golden crates, this is one of many rare records that I have listed. If you're looking for deals then I want to hear from you. 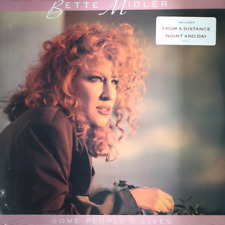 An Album/ LP by Bette Midler described as follows Label/Pressing Date: Atlantic Records label, pressed in 1980. Condition of Record: Nice NM-! (See below regarding grading). Sold as-is. EX = Excellent . Artist: Bette Midler. A: Under The Boardwalk (New Mix). Catalogue Number: a8976. the sound, which is why we play testall of our records. So you know the sound quality of the record you're getting, not just what it looks like. ABOUT THE RECORD No Frills is a rock and new wave influenced album by Bette Midler, and features three singles including Midler's take on the Rolling Stones classicBeast of Burden. I sing it better than anybody. ".